See also original Racks 42U 19’’ and 48U 19’’ plan location on their website! Zero U (0U) PDU’s increase the effective number of servers per rack. Full/Half/Third Racks available as well as single Rack Units. All racks are dually fed with two sources of AC power 230 Volt, with 32Amp or 16 Amp outlets. Optional 4KW/8KW/16KW per rack. 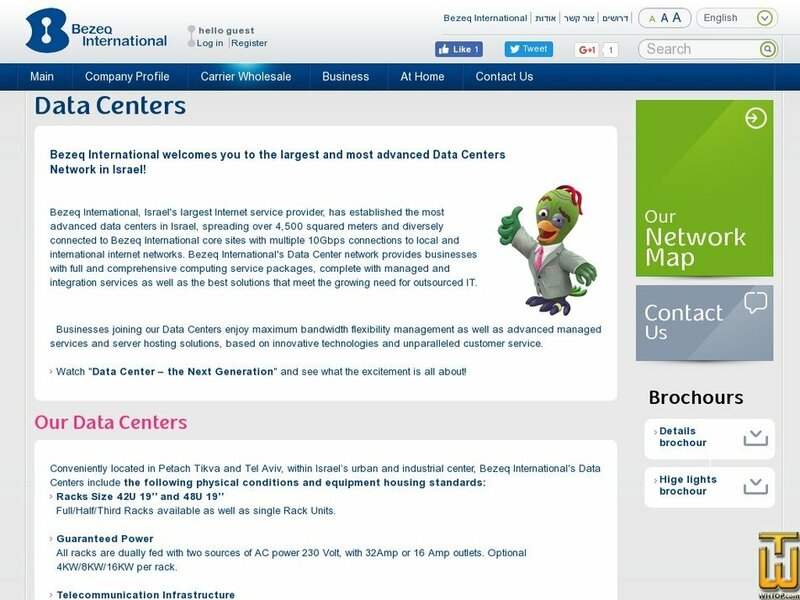 Bezeq International operates three Data Centers in Israel – two in Petach Tikva and an innovative, advanced site specializing in disaster recovery solutions that is located in the Landing Station of JONAH - Bezeq International's optical submarine cable system in Jaffa . Bezeq International's Data Centers are connected to six global points of presence in Cyprus, Italy, France, Germany, the UK and the United States. Our Data Centers are carrier neutral facilities with central Meet-Me-Rooms (MMR). Each facility has multiple and diverse physical cable entrances and access to all local network providers, local ISPs and the Israeli internet exchange (IIX). Our Data Centers provide cross-connecting remote hands services available on-site, as well as free wireless connectivity for our customers. Price: $ 72.00/mo. VAT 17% exc.